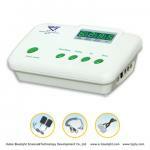 How does Bluelight Therapeutic Apparatus Cure for Diseases? 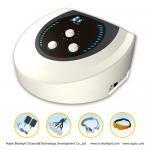 Your Position: > Knowledge >> Electro Acupuncture >>> How does Bluelight Therapeutic Apparatus Cure for Diseases? As Chinese traditional medical science says, life consists of Qi (vital energy) and lifeblood, and Qi is the commander of lifeblood, and lifeblood runs along with Qi. If both run fluently, diseases will disappear (Neijing, a famous ancient Chinese medicine book). The Chinese medicine theory also argues: people feel uncomfortable because of the bad circulation of Qi and lifeblood, if which runs smoothly people won’t be ill. Just as the saying goes, Impaired with Qi, he aches; impaired with lifeblood, he swells. However, if that Qi creates lifeblood and lifeblood takes care of Qi comes true, people will be healthy and gain a prolong life. On the other hand, the study and practice of the ancient Chinese doctors over the past thousands of years have proved that human body contains all kinds of channels. They work as the passageways of jointing the viscera of human body and promoting the circulation of lifeblood and Qi. If the channels are in emphraxis by catching a cold, wet, heat and bumping, hitting and pounding, then the circulation of Qi and lifeblood can’t occupy a high level, so diseases come into being. Linshu Channel (another famous ancient Chinese medicine book) describes that, Channels are the key to people’s lives. They heal all kinds of diseases and regulate the Qi and lifeblood circulation and, anyway, must be kept smoothly running without any hindrance. Therefore, in the clinical work, Chinese medicine pays great attention to dredging the channels and promoting the circulation of lifeblood and Qi by massaging the acupoints of human body. And, the treatments of internal exercise, Qigong, medicine and acupuncture are all on the basis of dredging channels that can harmonize the five viscera and six bowels, balance Yin and Yang, play the role resisting the exogenous pathogenic factors and protect the organism. The process to the treatment of Bluelight Eight-Diagram Therapeutic Apparatus is to circularly move the electron of frequency conversion electricity while passing on the relative acupoints of human body with the pace and dynamics incomparably better than that of internal exercise, Qigong, medicine and acupuncture. So it can really dredge the disabled channels, promote the Qi and lifeblood circulation, balance Yin and Yang, regulate the organism, cure diseases and keep health. 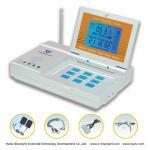 All in all, the Bluelight Eight-Diagram Therapeutic Apparatus can cure the internal diseases through external treatment both superficially and originally and makes the treatment without any injections, medicines or drug bags come true. Electrotherapy, magnetic therapy: Bluelight Eight-Diagram Therapeutic Apparatus outputs a safe current circulating within the body channels and collaterals to re-adjust the magnetic field distribution by interacting with biological agents to bring in bio-magnetic field, which achieves harmony and unity of the Internal and External, and the balance of the cellular in-exenvironment and promotes the metabolism speed up to cure illnesses and diseases. Tuina, massage: Massage specific parts of the human body simulating doctor practices, and combining "force" and "will" and "information" to adjust the injured tendons, qi and blood and viscera functions, to change pathological condition, to relax tension in the muscle spasm, make through Qi and blood, promote blood circulation around the lesion tissue and increase the flow of the tissue to cause to promote the blood circulation, decrease haemostasis and balance “Yin” and “Yang”. Acupuncture, Baguan: The frequency currents flow through the body channels and collaterals modeling electroacupuncture patterns to stimulate the corresponding acupuncture points, which achieves the acupuncture function, But there is no Broken Needle, Halo injections, nor difficulty of finding points; the output special electric current functions on body surface, which can produce negative pressure and imitate Baguan to make congestion stasis in parts of the body, reaching Qi and blood circulation, relief of swelling and pain, scatter of cold and illness prevention. Qigong: Qigong is the use of the circulation of Qi to arouse human potential to promote the Qi and blood and clear stasis. Bluelight Eight-Diagram Therapeutic Apparatus obtains the same effect to qigong through double-poles output the strong and weak electric currents following the electric potential height along with the human body channels and collaterals to move Qi and blood and makes a connection of the acupuncture points. Without hard practice of qigong, the product is a “qigong apparatus” for everyone. Podiatry: The human body 12 main channels connect in the body ends, and each organ has the corresponding nerve reflection space in the feet. By outputting the rhythmic electric current of frequency conversion to stimulate these parts, the product can put the human biological condition in a harmonious unity, and make the main 12 channels and all organs totally expedite, the internal organs in “Yin” and “Yang” balance. Previous： Why Do You Choose Bluelight Eletro Acupuncture?